In the past, Broseley has manufactured lines of stylish wood burning stoves. 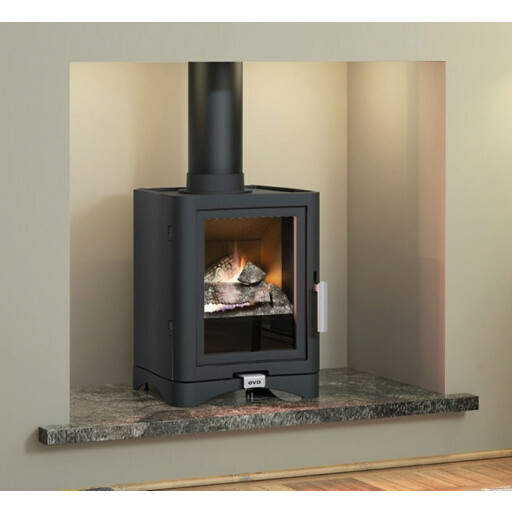 Now the manufacturer has developed an attractive range of gas stoves, including the Broseley Evolution 5 model. This design requires either an actual chimney or a prefabricated "Class 2" flue. A five inch flue pipe attaches to the top or the rear of this gas stove, permitting flexibility in installation. People seeking an appealing natural gas stove will enjoy reviewing the exciting Broseley Evolution 5 Gas Stove at The Fireplace Warehouse. This product features a transparent window to showcase a vivid flame effect and log display. Constructed mainly from cast iron and steel, this generously-sized Black coloured stove weighs 90 kilograms. It generates some 4.7kw of heat, with a reported efficiency rate of over 80%. The Broseley Evolution 5 Gas Stove offered through The Fireplace Warehouse carries a solid 5 year warranty. 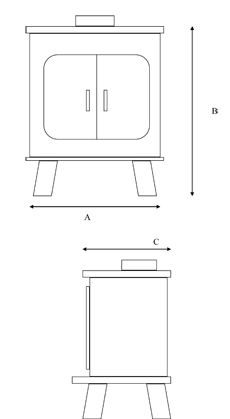 The standard versions of this stove features a manual control system. For an extra charge, customers enjoy the option of obtaining a remote control device for this model. Consider placing this product in any setting meeting its installation requirements, including both homes and businesses. This stove provides a wonderful, delightful source of warmth and beauty. Its fashionable design makes it an appealing addition to virtually any room!